Here’s a fun problem that continues to grow that Nurfatimah Merchant and I included in our textbook . How many uniquely defined curves can you find whose graphs contain the points (1,1), (6,-3), and (7,3)? NOTE: Some of the algebra below is very intimidating to those who aren’t pretty good friends with mathematical symbol-pushing. If you like, you can skip to the brief video clip at the end of this post showing all solutions. SOLUTION ALERT — Don’t read any further if you want to play with this problem yourself. Many students instantly think of vertical parabolas of the form , but when I presented this at the MMC meeting in Chicago tonight, two stellar Geometry teachers on the front row suggested circles. Others correctly noted that there are infinitely many curves defined solely by those three points, but I’ll talk about that in a second. Most students first think about vertical parabolas and circles. From the generic equation for a vertical parabola, one could plug in the three given ordered pairs and create a 3×3 system of linear equations. I argue that a CAS is a good call here, especially when it can give the quadratic equation in multiple forms with equal ease. That’s lots of algebra, but it was all completed very quickly using my CAS, proving another technology advantage is that all forms of an equation are equally easy to compute on a CAS. When people try to solve this problem by hand, they invariably use the standard form only because the algebraic manipulations in the other cases are unwieldy, at best. Here’s an image of the curve using the factored form of the equation. The circle was also easy to get using a CAS to drive the algebra. This graph shows the circle and the vertical parabola together. A horizontal parabola can be obtained just as easily, but I’ll leave that one for you to discover. This past summer, I was prodded by a teacher at the institute Nurfatimah and I ran for Westminster’s Center for Teaching to find all rotated parabolas which contained those points. To do so, I thought that if a parabola rotated some units contained those points, then if I could rotate the points back units, the corresponding parabola would be vertical, and I could solve it using my CAS as above. 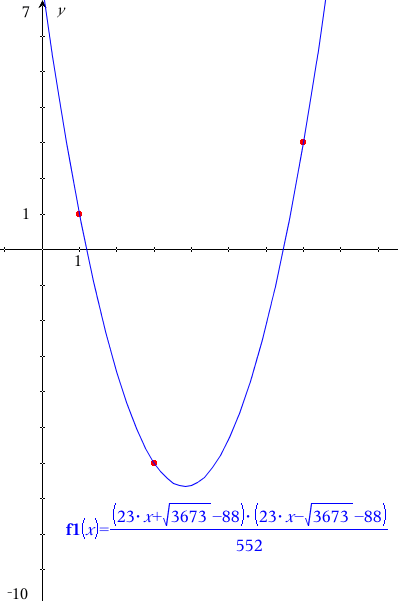 Using a transformation matrix on my original 3 points, I found their rotation images and substituted these into the standard form of a vertical parabola, as shown below. Substituting the expressions in terms of for a, b, and c back into the standard quadratic, and rotating the equation back into place created a generic equation for a rotatable parabola through the given three points. I used this equation to define my rotatable parabola through the 3 points with a slider for here on GeoGebraTube (here is the original GeoGebra document). You don’t get to manipulate it, but the following vimeo clip shows all of the rotated parabolas for . As a final bang for the presentation, one teacher in the audience wondered what it would look like if a trace was placed on the rotating parabolas. Easily done. Whether doing this in an Nspire CAS or on GeoGebra, right click the curve and select trace on. Dragging the slider for the angle through all of its possible values creates the following graph. Now that’s just pretty! The enveloped triangle in the center is precisely the triangle circumscribed by the circle found above. It’s straight edges are defined by the degenerate cases of the parabolas at the instances when the vertices were stretched to infinity. As some in tonight’s audience pointed out, there are also infinitely many rotated circles and ellipses defined by these points. 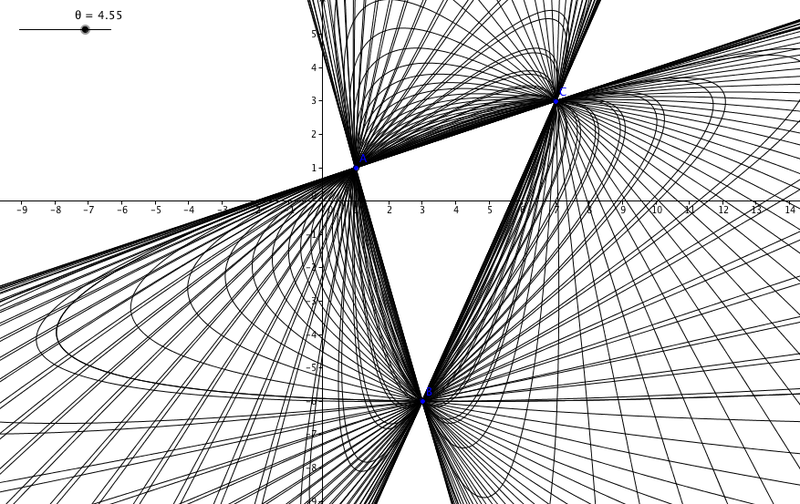 Another wondered what would happen if a trace was placed on the rotating vertex instead of the entire parabola. On that last question, we’re pretty certain that the curve is some sort of “tri-perbola”–a ‘hyperbola’ with three branches–whose vertices are the three given points. We don’t know an equation for it (yet), so that and other great extensions of this are now problems for another day. I’d love to hear what others think or find in this problem. This entry was posted in CAS, problem-solving and tagged CAS, conics, geogebra, Nspire, quadratic, rotation. Bookmark the permalink. As the teacher who brought up the rotating parabola thing this summer, a few preliminary notes. I’ll follow up with a bit more once I have a chance to work out some details on a CAS myself in the next day or two. The problem, for me, actually started about a decade ago, and really started with the curve traced by the vertex as we turn through the family of parabolas. For “relatively equilateral” triangles (like the one above), the curve does in fact look like a “triple parabola”. It is tempting to assume from that graph that the curve is some sort of cubic. However, as the triangle gets very obtuse (its not just as simple as obtuse vs acute, interestingly), the curve gets much more complicated. The portion of the graph at the obtuse vertex turns into a strange looping W-shape, and the graph begins to intersect itself in interesting ways. This was the sort of behavior that got me really curious (just what sort of graph was this?). It wasn’t too hard to get the equation of the curve as a parametric graph, parameterized by the slope of the axis of the parabola. This suggested that the explicit form would be a 7th (!) 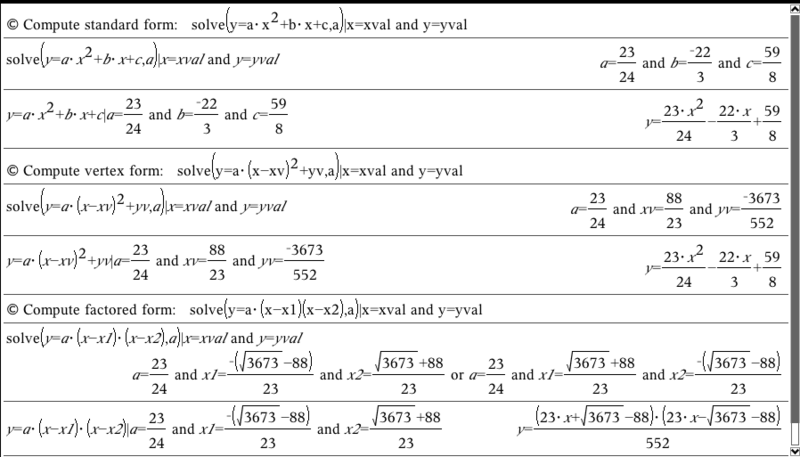 degree polynomial in x and y. Actually finding the explicit form was much more of a challenge, and made interesting use of CAS resources even back then. Trying to give the entire problem to a program like Mathematica made my computer cough up a hair ball, so the trick was in trying to cleverly chop the problem down to a managable size by hand and then feed the bite-sized portions to the computer. I did work out a general equation for the curve traced by the vertex, and will post the one for the triangle above once I get a chance to crunch the numbers. The nicest form for me was in terms of barycentric coordinates. – It is a 7th degree algebraic curve (i.e. the graph of a 7th degree polynomial in x and y). – It passes through all three vertices, and has a triple point at each. – It has asymptotes parallel to the sides of the triangle, and located 1/4 of the way from each side of the triangle to the opposite vertex. – Including complex values, the singularities of the curve are 3 triple points (vertices of the triangle) and 6 double points in the general case. These points are exactly the intersection of the 7th degree curve with a particular cubic related to the triangle. Also worth noting: The same sort of curve for the foci of the parabolas is only 5th degree. 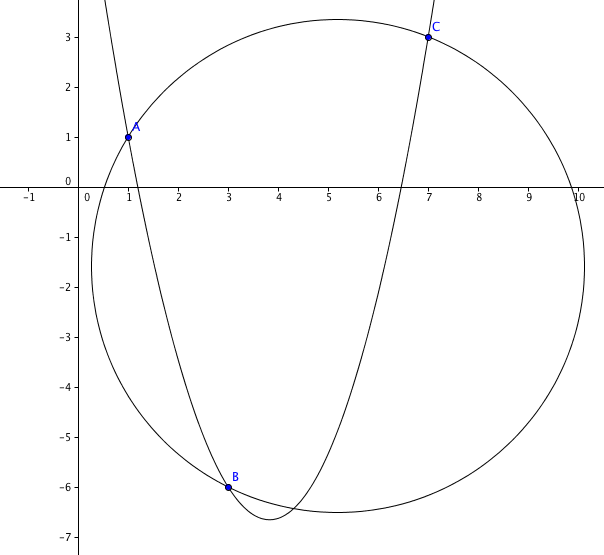 There should be a family of curves “morphing” one to the other by tracing various points on the axis of the parabola (e.g. the one 1/2-way from the vertex to the focus and so on). The curves will be 7th degree all the way, but some sort of conic “drops out” when you get to the focus. I’m not sure what that factor is — the line at infinity twice? The circumcircle? Worth investigating. Well, I did promise an equation, so here goes. Unfortunately, I’m finding that putting it into (x,y) form creates some very very big coefficients, so I’m going to just give the barycentric form. First then, a note about homogeneous barycentric coordinates. In any triangle, we can define a set of coordinates which I will give as (u, v, w) where each coordinate is associated with a vertex of the triangle. One way to view it is that A = (1, 0 0), B = (0, 1, 0), and C = (0, 0, 1), and everything “fills in” from there. Or, in other words, the first coordinate is proportional to the distance above the line BC, scaled so that point A = +1, points on BC are “0”, the centroid would be 1/3, the reflection of A in BC would be -1, and so forth. When done this way, the coordinates of any (finite) point will sum to 1.
if we lift the restriction that the coordinates sum to 1, and just state that any two points whose coordinates are a scalar multiple of each other are equivalent, we get a projective version. The coordinates that sum to zero correspond to the line at infinity. This also extends without any issues to the complex projective plane (which, although scary sounding, is arguably the natural setting for some of this). At any rate, the equation of an algebraic curve in these coordinates is a homogeneous polynomial in the three coordinates — in other words each term is the same degree (so that if you multiply all the coordinates by a constant it will factor out of the polynomial). Anything past that, I leave to the “zealous reader”.